Why We Should Stop Asking, "Does This Spark Joy?" My Aha Moment! You are here: Home / Lifestyle / Why We Should Stop Asking “Does This Spark Joy?” – My Aha Moment. You may have been living under a rock if you haven’t heard of Marie Kondo. She’s the cute, petite woman who’s been popping into people’s cluttered, messy homes for the past month on Netflix (longer, if you’ve read her book, The Magic of Tidying Up) encouraging people to ask, “Does this spark joy?” before deciding whether or not something is worth keeping or getting rid of. During the challenge, a poignant blog post was published from The Guardian criticizing Marie Condo’s advice and beliefs. Gasp!! Criticizing?? Who could ever think that tidying up your home was a negative thing?? However, the author points out that this method of just getting rid of things that don’t spark joy anymore means that discarded items ultimately end up in landfills (yep–even if you donated it, it may very well be trashed by the thrift store since they only sell a portion of what is donated) and third world countries. The resources used to produce it get wasted, too–the water, the energy, the labor, etc. ; all the things we don’t seem to think about as consumers. Essentially, the author of the article claimed we’re promoting a “disposable” culture if we simply get rid of things that no longer make us happy. The solution, she claims, is to stop buying so much stuff, not getting rid of things. 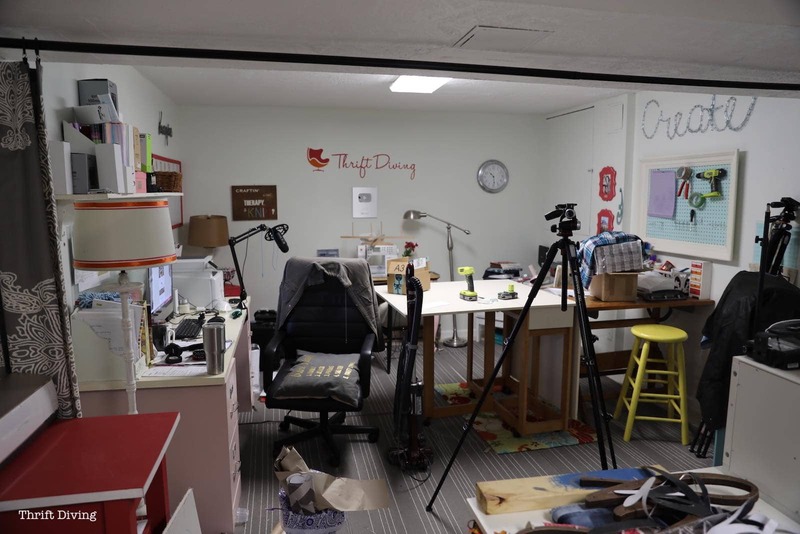 If you don’t believe me, look at what I was up against in my basement office for our January Room Makeover challenge: messy, cluttered, and in my opinion, an excess of stuff. Some of it just needed better organization. But there were clearly pieces that needed to go because they “no longer sparked joy” for me. What you may not notice is that little red mid-century modern table amongst the clutter. It’s the very first piece of furniture I bought back in 2002 after buying my first condo. I bought it from one of my favorite thrift stores for a mere $6.00. I remember spray painting the brown laminate top a brilliant red, proud to have found such a gem. While I was very proud of the piece, it never seemed to quite “go” with anything in my house the last 10 years of the 17 years I owned it. 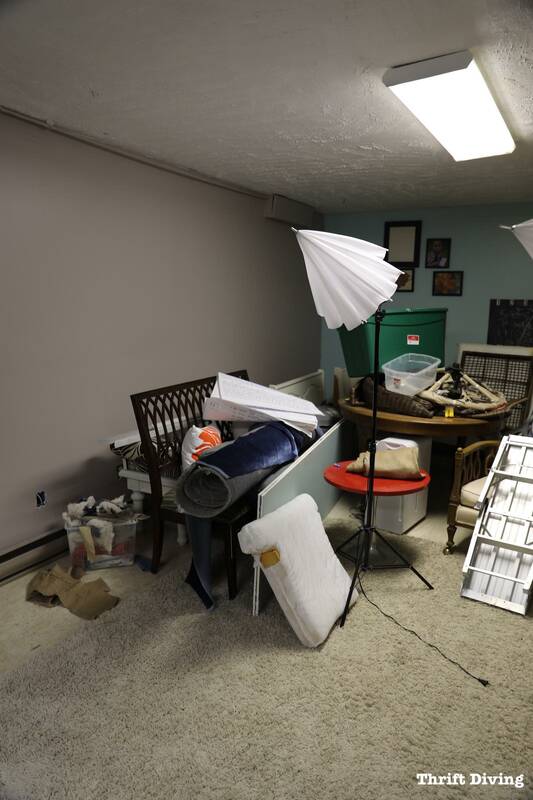 Fast forward a couple weeks later to the end of the room makeover challenge and my basement was coming along, looking cozy, clean, and decluttered. I realized that I needed a side table for the love seat and chair seating area I had created after all that clutter was removed. 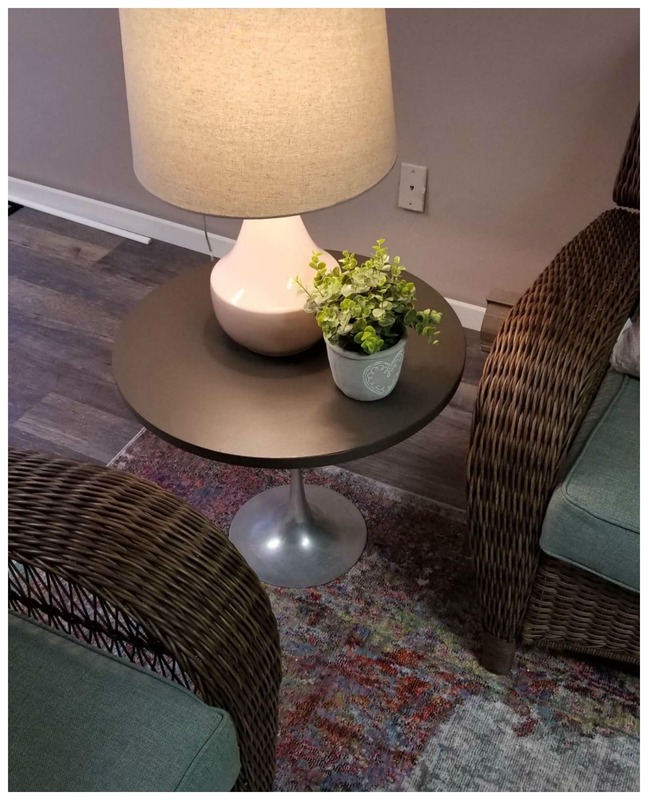 It didn’t make sense to go and buy another one, so I lugged that little red table back to the basement, slapped a new complimentary coat of paint on top to go with my new color scheme (and I’ll admit–a new lamp from Target), and what do you know–it sparked joy again! I shouldn’t be shocked at this concept of making something new again. After all, that’s what I do here at Thrift Diving. The uglier, the better is my motto. 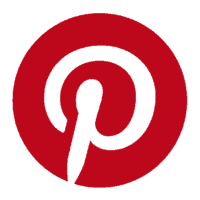 Decorating your home on a budget and reusing what you can was the basis of how this blog started. But even I am a victim of consumerism. Just because I tend to go thrift diving for many of my furniture items, doesn’t mean my consumerism is better than the next person. What matters is that I was going to buy something else that sparked more joy; something that “matched better” to my basement office for the room makeover I was doing. I was going to discard something because just because it didn’t spark joy anymore. And that, my friend, was the wrong thing to do. 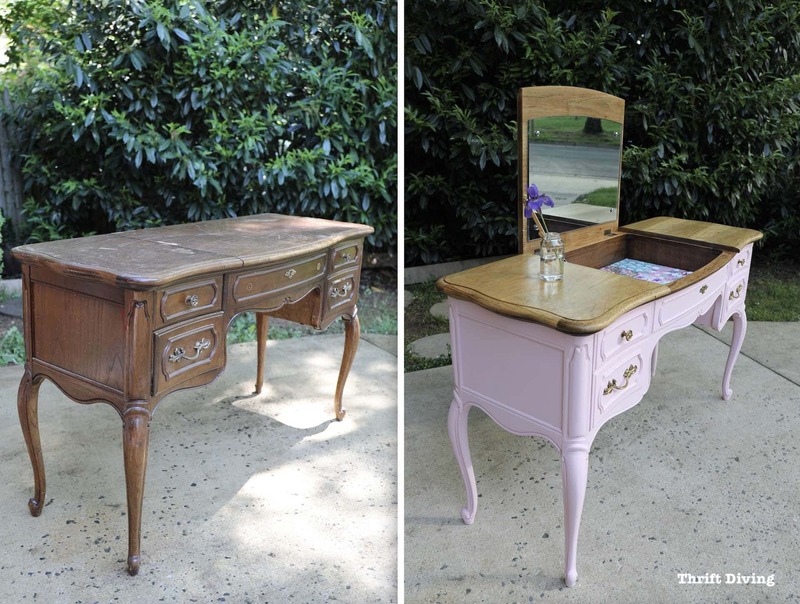 Just imagine how many pieces of furniture that someone discarded because it no longer sparked joy for them…pieces that I picked up from the thrift store and made them look amazing again. Do you think if the donators had imagined their piece of furniture could spark joy again that they would have given it up? Maybe not. “Could I repurpose this into something else?” (Read this article to get some creative ideas!). If we ask ourselves these more detailed questions instead of just asking, “Does this spark joy?” then we could save ourselves a lot of money (by reusing what we have)…do more for the planet (which prevents overfilling landfills)…and making more mindful purchases from the beginning! I’ll admit that even as much as I love making things over, asking myself these questions won’t stop me from ever making another purchase again. And it won’t stop me from donating to my favorite thrift store (which does help the communities the thrift store supports). But it does make me pause to think about each purchase and whether I really need to bring that home with me or if I can reuse something that’s already in my home. Be sure to SUBSCRIBE so you don’t miss the next post! I love shopping at thrift stores. I do a lot of DIY during the summers with furniture. I have also found a lot of furniture on the side of the road that I have refinished. With hubby out of town a lot he’s never happy when he gets home and goes into the garage. My latest find was two barstools sitting by a dumpster in the rain when we went down to see his brother in the hospital, he was a bit irate when I made him put them in the truck to bring home. I cant use them but I will put new seats on them and find someone that can use them. I really enjoyed this post. This method of decluttering seems too “in the moment” for me. You put words to a lot of what I think I feel when I try this out. I read the Marie Kondo book. Asked myself the “does this spark joy”? question. One thing the book REALLY did for me was give myself permission to re-home (great word by the way!) a piece of furniture given to me in my childhood, essentially to buy my silence on some inappropriate physical contact. Ive had that piece of furniture most of my life and couldn’t look at it without knowing why I was given it. Since selling it, Ive felt SO much better! A weight is gone! Its a nice piece of furniture and it deserved a better home than I gave it. It now belongs to another little girl who already loves it (her mother sent me a picture of her daughter with it). Serena-Love you. You are doing so much to repurpose things and to encourage the rest of us to do the same. That is exciting and fun. Now I am going to pull the age card on you. I am a baby post WWII. My mom and dad learned from their parents not to waste anything. When my mother was a young woman, she had shiny, waxed hardwood floors, not because she had an electric floor waxer but because she wrapped a worn out piece of clothing around a brick and rubbed. (This is where people reading this will roll their eyes and snicker and tell me to come out of the dark ages.) Their house was filled with furniture from parents, grandparents and aunts and uncles. As years passed, through the 50’s, the economy was good, and Mom and Dad both worked outside jobs. But always, we were told and taught to use what we had; rebuild it, fix it. Dad saved every unbent nail that was pulled out, he sharpened tools and the kitchen knives regularly, Mom sewed buttons on, let out seams, cooked with whatever was on sale that week and I have to say, I never felt deprived or secondary. Now, we are pounded by commercials and advertisements that tell us we need this and that, but, as you so honestly point out, we need to ask “does this bring us joy?” or “can we use this another way. ?” Not all vintage articles are good or great enough to be saved and we want to enjoy the new styles, but if we can reuse (whatever it is) it, will keep it from contributing to the landfill and help our environment. We’ve learned from the 50’s, plastics are hurting the planet, trash is filling up our land and oceans,the time is now to “not buy” without much thought, conserve where we can.